Former truck driver John ‘The Ferret’ Moran has received the ultimate recognition for his services to the community in charity organisations when he was awarded an Order of Australia Medal (OAM) on Australia Day. 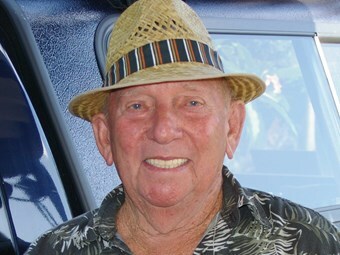 Moran began driving trucks in the late 1950s at age 23, carting pineapples out of Yeppoon in Queensland. He drove for a number of companies during his career, finishing up at Brambles Tanker Division. From the late 1970s, Moran became a familiar name throughout the road transport industry through his magazine gossip column, earning him the nickname of ‘The Ferret’. However, it was his co-founding with truck driver David Gauldron of the original Brisbane Convoy For Kids in 1989 that started a new chapter in Moran’s life. He has continued to be an important figure in the Convoy for Kids movement. He is a life member and patron for the Convoy For Kids (Sydney), and co-patron, along with the late Slim Dusty, of the Lights On The Hill Memorial at Gatton, Qld. Moran, 81, says he never realised that his continuous work with fund-raising activities would lead to the honour of being awarded an OAM. "I’m just stoked," Moran tells Owner//Driver. "You never get out of the bed in the morning saying ‘I’m going to be a hero today’, these are just things that happen to you through your life. "This has taken me a whole lifetime. We’ve had 240 convoys now all over Australia, and it’s looking at $8 million raised." Moran was inducted into the Shell Rimula Road Transport Wall of Fame in 2002. Over the years, Moran has embraced bush poetry, writing two books – A Time To Reflect, and From Here To There And Back Again. He has also recorded and released two CDs. Despite his advancing years, Moran says he will continue to play a part in the Convoy For Kids movement. Last November he attended his first i98FM Camp Quality Convoy, admitting he was "gobsmacked" at the huge support the Illawarra-based event attracts. Moran's upcoming engagements include the Lights On The Hill Memorial Convoy on February 22 and the Putty Road Memorial Service on May 17. "I’m fit as a fiddle," The Ferret smiles. "I’m sort of down a bit on energy I suppose, but my mind’s as nimble now as it was when I was 15, I reckon."